I'm excited!!!! Who is going? Prince’s Paisley Park in Chanhassen, Minnesota has announced programming details for its annual four-day special event, CELEBRATION, honoring the unique life and legacy of the prodigiously talented cultural icon Prince Rogers Nelson. Taking place between April 25–28 at Prince’s historic home and recording sanctuary outside Minneapolis, the event will welcome fans from around the world into an inspired environment of live music, concert screenings, panel discussions and special presentations highlighting Prince’s tremendous talent, influence and importance as a composer, musician, producer, live performer and filmmaker. Prince often invited to DJ his own private parties around the world and special events at Paisley Park. 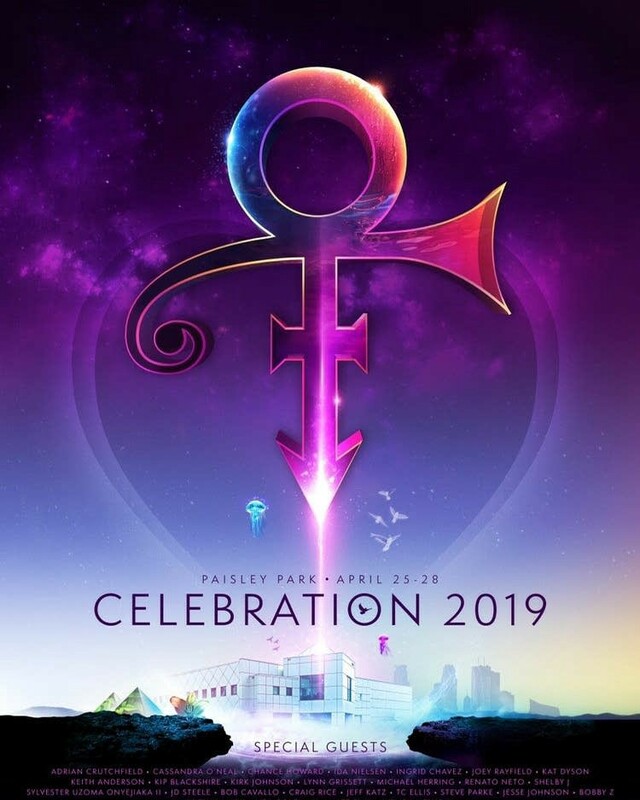 In addition to featured musical guests, Paisley Park has announced a broad list of special guest speakers who will take part in exclusive panel discussions at CELEBRATION 2019, including keynote conversations with Prince’s longtime manager Bob Cavallo; Prince’s personal photographer and creative collaborator, Jeff Katz, who worked closely with Prince through iconic eras, namely Parade, Lovesexy, Sign O’ The Times and Batman; and award winning singer-songwriter Ingrid Chavez who will join producer Craig Rice, rapper TC Ellis and visual artist Steve Parke who were all instrumental in the Graffiti Bridge film and accompanying soundtrack. Overall the list of contributors this year includes collaborators and friends spanning five decades in Prince’s life. Regular ticket $549.00; VIP $1049. Plus fees. What do you guys think, over/under 10 tickets sold come showtime? The event was sold out both last year and previous. yeah kirk johnson is gonna be there ! It is great that they are doing the Prince on the Big Screen event again.That is worth the price for me. I am only interested in the new Prince music, videos, concert footage, etc. I'm much less interested in the panels and performances by the associated bands, but I know that some other fans really like that stuff. Let's hope they surprise us and show us both full shows from 1/21/16 this time in addition to the concert at the Armory. Nice to know people got Bank like that! Does Jesse live in Minneapolis right now? I also really enjoyed the Prince on the big screen event and looking forward to it this year. Would be cool if this year it was 80’s Prince on the big screen and the Rev the live band on stage!!!! I enjoy the panels too tho!!! I just purchased VIP. I missed out on the VIP last year and didnt want that to happen again. am I hope you are 2. NOW will they release some music to coincide????? Great line up. Jesse is great live. Won't be going this year, as they've left it far too late for me to sort an international trip, plus the Revolution are coming to play in my backyard next week. VIP sounds a little steep, for what is essentially an extra DJ set and the chance to 'buy' other merchandise. Probably better off going down to First Avenue for the late night dance party and saving $500. I went the first two years and had a lot of fun but think I'll skip it this time. Revolution is always great but I've seen them a few times now including 2017 @ Paisley. True Funk Soldiers played last year and were cool. By now I know the drill. Films, panels, meal break, concert. A tour of Paisley in there somewhere. But at this point I've done it all and that's a lot of cash. I will probably buy a general admission ticket for the gig at the Armory and see what other events are going on like maybe a show at the Dakota or ??. I have my tickets! This will be my first Celebration. Lucky you!!! You get the dance party after at the armory!!! Have fun!!! It is fun meeting up with people that I met at the first one. It is like an annual fishing trip!! It’s fun! and quite poor from what I read (previous years) for what you get. (of which I think is expensive, but still OK). Does anyone remember what the VIP tickets cost for the 2002 Celebration when he played for 7 concerts? $550 for GA and $1050 for VIP is a lot of money and most people cannot afford that plus the travel expenses, but this is basically what they have charged for the two previous Celebrations and they were both sold out. If they want fans to continue to support it then they need to dramatically increase the exclusive Prince unreleased concert and music content and not just give us little teases of exclusive material. I understand the licensing issues, etc. but that is there job to work that out if they want us to continue to pay over $1000. The Big Screen concert is great, but you don't have to pay $1000 to see that and could access that for much cheaper by going directly. So, the Paisley VIP experience better have a lot of exclusive PRINCE content and not just panels and associated artists. I've had a difficult time getting excited about any Celebrations, associated artist performances or gimmicks like the Prince on the big screen. It just all feels so empty without him there. Plus, I know times have changed. But I remember during the first Celebration, I'm pretty sure I paid $250 a ticket for 7 nights or Prince performances at Paisley Park. Now, over $1,000 to hang out and listen to a panel of people talk about him? PS. I realize many love this kind of stuff, and I respect your views hope you all have a great time. This kind of stuff is just not for me. If it breaks when it bends, you better not put it in. I don't disagree with much of what you said. I find myself going to these things because it is all we have. I just wish they would give us access to a lot more exclusive Prince content and that would be the next best thing to having him there. 1000 $ on replay mode i'm afraid..